Listen to DRM Digital Radio Broadcasts. Some tests with the Avion AV-DR-1401. The Avion AV-DR-1401 design looks a bit odd. On the 29th September 2015 I paid INR 13'605.00 to Avion's bank. That's what they charged me, 1 radio priced USD 175 + USD 30 for bank charges, USD 205 in total. After some correspondance I was told that the delivery would be in October. October came and went and in the middle of November I was told that they could ship it immediately if I could provide them with a DHL or FedEx customer number. Finally they mailed me on the 26th November that the receiver had been shipped to me by FedEx. The parcel had been picked up from Avion on the 24th and left for Dubai on the 25th. From there the parcel went to Paris and on the 27th it arrived in Stockholm at 8 in the morning. That was on a Friday, so it was delivered on the following Monday around noon. I paid USD 179 (!) for the shipping plus another USD 62 in charges and VAT. With a pricetag of total USD 446.- this makes it the most expensive radio I have bought for the last 35 years! The DR-1401 is 280 mm wide, 70 mm deep, 130 mm high and weighs about 1200 gram. I believe the speakers account for almost half the weight! It came with two remote controls which allows one to be mounted on the radio itself and the other one can be used to perform all settings from a distance. On the front there is a multi-purpose knob which can be used to switch on and off the radio from and to stand-by, to adjust the volume and to tune the radio. Like the Newstar, the clocking of the pushbuttons on the remote control seem to be a bit on the slow side, so one needs to pause when pushing the same button repeatedly (when setting the frequency). If you press a digit too long you will get a series of unwanted digits in the display. Some of the buttons on the remote control have a tendency to bounce, so that you might get 66 instead of 6 when you press the button. Sometimes you don't get anything when a button is pressed, but that could be because of the slow clocking. The odd layout of the ten digit keys add to the confusion when selecting frequencies. The Avion Remote Control unit with the odd ten-key layout. The radio comes with a built-in 3.7 Volts Li-Polymer rechargeable battery with 6000 mAh capacity. This allows the DR-1401 to play for up to 10 hours without an external battery charger. An AC/DC Power Supply with 5 Volt output is used to charge the DR-1401 from a 230 VAC wall outlet. The power supply is extremely noisy and you cannot use it when you want to listen to DRM or AM. It also says so in the User's Manual. There is a CE mark on it for all it's worth. The charging time is minimum 5 hours to fully charge the battery. Once the battery is fully charged, the charging LED will switch from blue to green colour according to the user's manual. Mine was green all the time. The reason for this was a production error: Only the green part of the LED was soldered to the circuit board. The blue LED was either removed or never soldered. 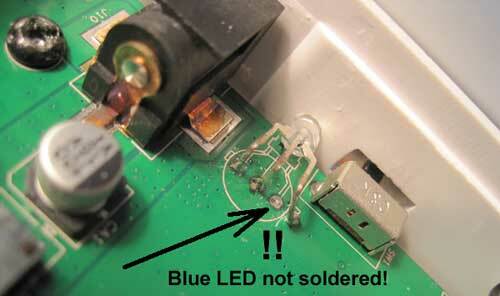 The lead of the blue part of the LED was not soldered. One minor drawback with the LCD Display is that it seems to have been designed to be looked at from an angle from below rather than from above. When the radio sits on a table and you look at the display it tends to be fuzzy. Lean the radio back and the colours come out much brighter and more colourful. The volume control is in steps, it works well and there is plenty of power for the two heavy duty loudspeakers. I started with the radio set to FM mode. The scanning works only on FM according to the user manual. What happened during the scan was that the stations it found were added to memory channels, not a scan one by one. At least it found all the local FM stations very quickly. The somewhat weaker local FM stations I had to select by their frequencies and store them manually. There is no scan function on Medium-, Short wave or DRM. There is no noise as long there is nothing on the frequency. The speaker is muted. Selecting a station can be made either using the knob on the front or to use the numeric keys on the keypad on the remote control. The keys are prone to bounce, so when you press a digit you may get two digits of the same in the display and you end up either on the wrong frequency or on something entirely out of range. Another drawback is when you find a DRM station in AM mode and you switch to DRM, the frequency is lost. It is necessary to type in the frequency again to get the DRM station. Unfortunately for the keen shortwave listener, you can not just press the knob on the front and turn the knob and tune the band until you hear a station. When you stop turning the knob for a while the set locks up on the frequency and if there is a signal stong enough to open the muting, the AGC starts stepping up gradually and you get sound in the speakers. If there is nothing on the frequency, you get nothing but silence. As it is in this firmware version you have to know the frequency which you want to listen to, tune it and hope that you will be able to receive it. Some might say that this was not easy and I will join that club as well. And when you have sound in the speakers and start turning the tuning knob again, the sound of the previous channel will play until you stop tuning and then the receiver switches to the new frequency. There is no way to listen and tune. The stations can be stored in memory by pressing DELETE/STORE for 3 seconds. Deleting channels can be done the same way. Select a memory slot and press the DELETE/STORE for 3 seconds and the memory is freed up. To change to a memory channel just use the LEFT/RIGHT arrow keys on the Remote Control and press OK. After a short while the radio should open up and hopefully play. There is a problem with the memories too. Sometimes when trying to store a channel is is not possible. Trying to store BBC on 17790 kHz was not possible. According to Avion this will be solved in the next firmware release. Another thing is that the radio won't play for more than an hour at the time. Suddenly it switches itself off and when this happens no buttons on the remote control work and you cannot switch the radio on again without first switch off by using the slide switch and then reboot. In case you were in the middle of logging a DRM station, there will be nothing saved to the Micro SD card. The DR-1401 now supports multi Multimedia Object Transfer protocol (MOT) on DRM transmissions. The signal locking in AM mode is 100 times faster than the previous software. The switching between the modes has become more smooth without any obstructions. Another licence issue has been resolved so that the receiver won't shut down automatically after 60 minutes. Perhaps the most interesting news is that the sensitivity and the gain for the DRM in MW and SW has been increased after a number of rigorous testing and field trials. Now, how has this improved the receiver? I must say, unfortunately - not much. I used the DR111 one morning together with the Avion AVDR-1401, both sitting on a table using their telescopic antennas and tuned to BBC on 3955 kHz. How do these two now compare? The result? Well, perfect on the Newstar. The Avion burped twice, that was all. Sorry to say, without an external antenna the Avion receiver is not possible to use for DRM. And this after the information I got that the sensitivity on DRM has improved a lot with the new update. The same evening I tuned to Voice Of Nigeria on 15120 kHz using three receivers: My FRG-7700 with its external, active antenna in the garden, the Newstar DR111 and the Avion AV-DR-1401 both with their built-in telescopic antennas. Avion AV-DR-1401: The occasional fraction of a second audio burst with MER = 0 tp 7 dBm. When the Avion AV-DR-1401 shares the external antenna with the Yaesu FRG-7700: The MER flickered between 13 to 23 dBm and it played with continous audio. It seems like the telescopic antenna is not working despite its elaborate antenna amplifiers (or matching circuits?). The short wave tuning with the DR-1401 is useless (or at lest very tiresome) for the everyday short wave listener. Tune into a frequency and it takes several seconds for the receiver to lock up. When it eventually does, and there is no transmitter on this frequency, you must push the tuning knob again and step to the next channel and the same procedure starts again: Wait for seconds - lock - sound(? ), if no sound, press the tuning knob again. There is not a single signal to hear when the telescopic antenna is used even if the same signal shows S9+10 dB on my old FRG-7700. Needless to say, you'd need an external antenna to get any sound from the speakers in the Avion DR-1401. Perhaps there is an issue with the telescopic antenna? I will try to find out. To be fair to Avion, I need to change what I said about the tuning. With the external antenna connected I discovered that it is possible to tune into a channel (in 1 kHz steps), wait until the Avion locks to the frequency (takes a while), and if you don't hear what you like you CAN continue tuning - IF you do so within 2 (max. 2.5) seconds - otherwise the DR-1401 locks to the channel and you need to press the tuning/volume control again. The muting on short and medium wave has now been deactivated so you can listen for weak signals. It looks like the FM reception is better than before, as I can listen to a local FM station which I could not receive at all before. The muting on FM seems to be deactivated, or at least the mute treshold has been lowered. In DRM mode I noticed that the display now can show Mode B or C (in the beginning it was only "A" all the time). Unfortunately, what I thought about the improved sensitivity on FM turned out to be wrong. it is not possible to connect a signal generator to the Avion in FM mode, so the output of the signal generator was connected to the collapsed telescopic antenna, without a ground connection. A signal level of 250 uV (-59 dBm) was necessary to open the squelch which (unfortunately) is still in use on FM. This signal level results in a rather noisy sound in the speakers. The signal strength can be read from the number of dots in the LCD display. As a comparison I hooked up the signal generator in the same way to my National RF-B60. With this receiver, a signal of -87 dBm to produce the same, slightly noisy audio output from the speaker. That means that my new Avion radio needs 28 dB more input signal than the 30 year older National RF-B60 to generate the same output result. The signal generator was set to 810 kHz and 1000 Hz, 30% AM modulation and connected to the external antenna socket. A signal level of 10 uV produces a rather noisy sound in the speakers. 5 uV produces a very noisy sound in the speakers. The same signal input method with my old RF-B60 requires a signal of 8 uV to produce the same, slightly noisy audio output and 4 uV for a quite noisy output. Result: Both radios seem to perform roughly the same on medium wave. On short wave (SW) the signal generator was set to 26.990 MHz and 1000 Hz, 30% AM modulation and connected to the external antenna socket. Result: Both radios need about 2 uV for a slightly noisy signal. An attempt to measure the SINAD sensitivity on shortwave in AM mode on the Avion failed. This was because of the beat tone and noise that is present on all frequencies. Initially the frequency was set to 26.995 MHz for the sensitivity measurement, but there was a rather strong birdie on this frequency and therefore the SINAD values are affected to the worse. Therefore I checked more frequencies for birdies. Frequencies such as 4015, 6105, 7330, 9460, 11850, 13510, 15785, 17780, 21540, 25740, 26510 kHz were chosen at random. All frequencies above 10 MHz are received with a beat tone which increases slowly in intensity and frequency the higher the input frequency becomes. The heterodyne stays on the audio output regardless of the signal strength. 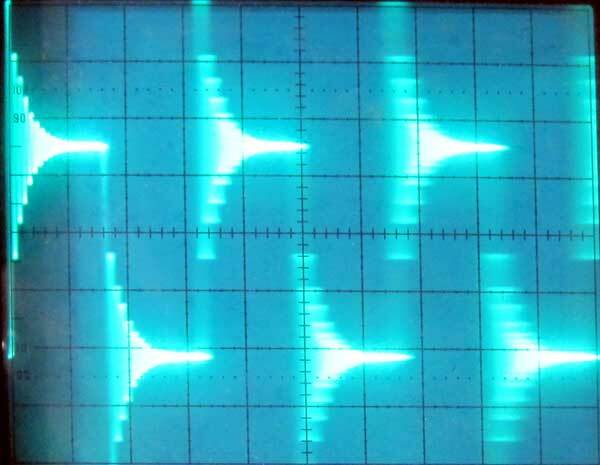 Further, a signal stronger than 30 mV blocks the receiver completely (measured on 21540 kHz). This blocking level varies slightly with the receiver frequency. One would probably not hear much of these beat tones when listening to AM short wave, but, if this kind of instability is present on DRM I think it would cause problems. That is probably the case, as the SNR value on DRM rapidly changes from 3 to 25 dB on RRI. Imagine you're watching an anthill after throwing a stone into it - that is what the display looks like! The SNR values are crawling around wildly. After having taken the radio apart I discovered that the telescopic antenna amplifier output was wired through a switch in the external antenna jack. Connecting an external antenna disconnects the internal antennas (on MW and SW) by this antenna jack switch. So why is the reception so much worse when using the telescopic antenna? I became suspicious when I got more noise by changing the shield wire's ground connection. Touching the loudspeaker terminals with a finger or a screw driver made the noise even worse. With an oscilloscope probe connected to the speaker terminals I understood that the problem came from there. There was a 300 kHz square wave about 3.6 Volt p-p present on the speaker terminals. This explains why there is a shield cover connection to the chassis of the speakers. The speakers radiate this 300 kHz noise plus a huge amount of harmonics. As everything on the PCB is covered by a shield plate it is almost impossible to trace the origin of this square wave. Without documentation or a schematic diagram one can only guess that the noise is caused by the class D pulse-width modulated speaker amplifiers probably designed without low pass filters on their outputs. Unfortunately, the entire PCB is under a shield cover which is soldered to the PCB (sort of soldered, the production line missed some of the mounting holes in my receiver), so it is impossible to see what sits underneath. One of the speaker sockets is located outside the shield, so I started there. The speaker connector socket was removed and instead two 68 uH chokes were soldered into the holes with 100 nF (0.1 uF) on the other side to ground to form a low pass filter. This supressed the noise a lot. The second speaker connector is hidden under the shield cover, so the shield of the cable was soldered to the shield case and the speaker cables were cut as short as possible. Each of the wires were connected to a low pass filter and the loudspeakers were connected with unshielded wires. In the beginning of July 2016 I noticed in a part of a schematic diagram I had got hold of that low pass filters actually are present on the loudspeaker terminals. I have not yet been able to take this part of the radio to pieces, so I cannot confirm whether my radio belongs to the lot Rev. A (without low pass filters?) or Rev. B (with low pass filters as shown in the schematic diagram). As previously mentioned, an attempt to measure the SINAD sensitivity on shortwave in AM mode had failed. This was because of the 300 kHz noise and beat tones that is present on all frequencies above 10 MHz. Unfortunately, the beat tones are still present on the audio output. Receiver sensitivity on short wave. Receiver sensitivity on medium wave. There was a large improvement on the reception on AM on short wave after having added the low pass filters to the speaker output terminals. Before this modification, almost nothing could be received on short or medium wave using the telescopic antenna. The max. SINAD measured with an RF level around 90 uV was around 19-20 dB on 15.665 MHz and 31.5 dB on 810 kHz. This because there is still a beat tone superimposed on the audio but most of the noise from the class D audio amplifiers is gone. 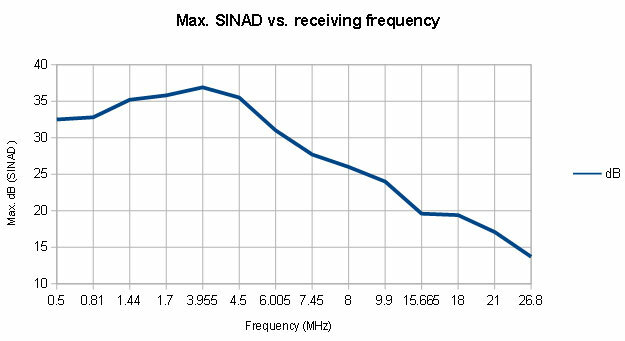 Below is a table with the frequency of the heterodyne tones and the maximum obtainable SINAD at the same frequencies (medium wave and short wave). The amplitude of the beat tone is slightly less than 50% of the wanted AM test tone. The Audio Response was measured with the signal generator set to 30% AM modulation and the modulation frequency was varied from 100 Hz to 6000 Hz. Two series of measurements were done, one on Medium wave (blue curve) and the second one on Short wave (red curve). The result is shown in the graph below. The audio response is more or less exactly the same on both bands. The Audio Response on VHF FM was measured with the signal generator set to 20 kHz FM deviation (that is the maximum I can modulate with the Stabilock 4040) and the modulation frequency was again varied from 100 Hz to 6000 Hz. The result is shown in the graph below. Above 6000 Hz there was practically no audio output. The audio response is more or less exactly the same as for AM on Medium wave and Short wave, which is a bit puzzling to me. I had thought that the FM sound quality should be a bit better than what I measured. DRM Audio measurements will follow as soon as I get my little DRM transmitter up and running! If you insert a formatted Micro SD memory card without any files written to it there will be problems when you scroll through the menus with the MODE button on the remote control. The radio is switched off by means of the main slide switch on the side of the radio. Turn on the radio by pressing the button on the remote control or press the volume/on-off knob on the front of the radio. It seems like the radio always starts in DRM mode, even if it was switched off on AM or FM by means of the slide switch on the side of the radio. Press mode from DRM over AM, FM, until the 'MUSIC NOTE' appears in the LCD display. Now, the radio does not react to any pushbuttons you press on the Remote Control. The ON/OFF switch on the front of the DR-1401 does not work. The only way to solve this problem: Use the slide switch on the side of the radio to cut the power supply. Take out the Micro SD memory card and as a precaution copy a short audio file (mp3 or wav) to the card. The AC power adapter should be used only to charge the built-in battery in the receiver. If the radio is swiched on with the power adapter is connected it is not possible to receive any DRM signals and the short wave reception suffers badly from the switched power supply. The noise from this adapter is so strong that it impairs the reception on my stationary short wave equipment with external antennas too. Logging DRM with the AV-DR-1401 is possible, but complicated. 1.1 Write the frequency you logged in the box below "Target" in Stations Dialog, in this case "17510"
1.2 In Dream, click "File - Open File - Files of type = All Files (*)" and locate the file you want to log, i. e. "17510000_2016-08-25_10-35-05.mdi"
1.3 Double-click on the file and check the box "Log to file" in the System evaluation. Note that only two items are available in the System Evaluation: "Audio Spectrum" and "SNR/Audio"
1.4 Let the file play until the end and uncheck "Log to file". 2. Open the DRM-Log Plotter and click "Update". Locate the folder with the log files, normally in the folder where Dream 2.1.1 is located. - Click "Load File" in DRM Log Editor. The file you want to edit is the last in the listbox. Click on the Frequency. - Edit the "New Log Date" and the "New Start Time"
- Click "Modify" and go back to the DRM-Log Plotter and click the "Show Logs" button. - Click on the log in the listbox. The log plots with the coreect date and time. 3.2 As the information in the .mdi file lacks certain data, many labels in the DRM-Log Plotter are empty. - There is no SNR, Doppler or Delay in the plot. There is still no solution to my problem and at present, February 2019, I am still waiting for a final answer from Avion how to solve the problems I experience with this receiver.